Recently I finished reading a book about “The Forbidden City” and this coincided with a BBC Radio 4 programme presented by Melvyn Bragg about the first western missionary to China, the Jesuit priest Matteo Ricci. I heard that Matteo Ricci set out from Portugal to convert China to Christianity in 1584, and published a book in 1603 called “The True Meaning of the Lord of Heaven” which was a dialogue written in Chinese, between a Western scholar and a Chinese scholar, in which he sought to accommodate existing Chinese religious beliefs with his Christian teachings. Subsequently the Western image of China was dominated by rules which Ricci set down. During the radio programme several references were made to aspects of Chinese culture which had only just come vividly to the forefront of my mind, through reading about The Forbidden City. One of these was the fact that 100,000 eunachs formed a buffer around the Emperor so it was extremely difficult to gain personal access to the Emperor himself. When I was a child I read a book in which the main protagonist, a little girl, goes off into a magical world, which included “nodding Chinese mandarins”. 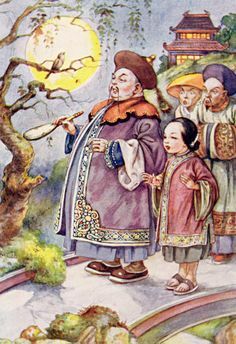 I realised that my own views of ancient China are conditioned by images and references in children’s books and fairy tales: the mysterious, inscrutable, exotic figure of the ancient Chinese emperor. Cut off from their own people these Emperors existed like pampered golden birds in a precious cage of priceless gems. Any attempt by later Western visitors to gain access to the Emperor would probably be met with a distant message relayed to them by one of the eunachs. One of the earliest stories I read about the mysterious world of ancient China was Hans Christian Anderson’s “The Emperor and the Nightingale.” This came back to me as I realised it was a perfect image not only of the way the ancient Chinese emperors lived their lives, but an image of power and despotism in the world today. It’s good to read of ancient civilisations and to reflect upon human power, and how transitory it is. And once again I realise the power of children’s stories to lay down the background for our understanding of the world, having an influence that may last throughout our lives. Thank you for your comment, Marcia! I loved reading such stories when I was a child too. One which I remember well, was a Swallows and Amazons adventure. You may think that they never ventured beyond the bounds of the Lake District, but look again! The tenth book in the series is one of the most exciting. Missee Lee relates the adventures of shipwreck in the China Sea and capture by pirates. This sounds fascinating, Lance. I also recall that Rupert Bear had some adventures in exotic far eastern locations… When I was in my early teens I read Fifth Chinese Daughter by Jade Snow Wong http://www.amazon.co.uk/Fifth-Chinese-Daughter-Jade-Snow/dp/0295968265/ref=sr_1_1?ie=UTF8&qid=1433174776&sr=8-1&keywords=Jade+Snow+wong%3A+Fifth+Chinese+Daughter and some years later a hard-hitting memoir of a Chinese concubine giving the most detailed account of foot-binding. I think in my blog post I was referring mostly to the stories we listen to or read when we are perhaps in the first ten years when we are most impressionable, and those images sink into our unconscious.